Home > 2016 > March > 22 > Books > Who misleads you about money? Who misleads you about money? To get the ‘gist’ of this book – in under 90 seconds . . .
And, of course, it’s what others (those who advise us) think they know, that just ain’t so, that can also get us into trouble with our money. You see, there’s a lot of nonsense written (and spoken) about money every day by people trying to sell us their latest whiz-bang product. This book replaces that noise with the truth about money and gives you a solid foundation for planning your future. And it’s developed from Part 1 of my previous book ‘Who can you trust about money’ with completely updated content. It exposes the ‘external enemies’ to your money and tells you exactly what you can do about them. But don’t take my word for this . . .
Read what the acclaimed author (George Cooper) thinks of it – in his foreword below. Wherever you live in the world – if you save or invest – this book is for you. Just keep in mind that some parts refer to UK tax and pensions. You want to spot the BIG financial tripwires before you fall over them. That covers people of all ages – because good money management is a skill, like driving a car, which we all need to maintain throughout our lives. spending it! Then as we get older and build up some wealth, we need to learn where to invest it, for reasonable returns, without a risk of losing it all. The ideas in this book will help you at any stage of your financial life – whether you’re just starting out, saving regularly over the long term, or you have a capital sum ready to invest, or you already have monies invested. And, this book will fascinate anyone who’s already an expert in this stuff! Chapter 1 shows you how to save more for your future by beating off the manipulative marketers who get us to spend all our money today. Chapter 2 shows you why all economic forecasts are wrong – and why our politicians can’t really control our economy or the markets. Chapter 3 gives you some smart ideas for spotting overpriced markets – which could help you avoid some nasty future shocks. Chapter 4 is a must-read for all investors. It shows why your ‘attitude to risk’ is not the measure to focus on when making investment decisions. And it explains the right one, of course, which is overlooked by too many advisers. Chapter 5 reveals the scary facts about ‘balanced’ investment funds that can turn out to be much riskier than you expect. And Chapter 6 offers powerful tips to potentially save you thousands of pounds in advice charges. In Chapter 7 you’ll learn what the government regulators can protect you from – and what they cannot. In Chapter 8 – you’ll learn about the big tax traps to avoid and why you do NOT want to use ‘aggressive’ tax avoidance schemes. In Chapter 9 you’ll learn how to cut the headline cost of a pension in half. If you only read one chapter, make it this one. In Chapter 10 you’ll learn how a £4,000 ‘day trade’ could lose you £8,000! In Chapter 12 you’ll learn how to get solid guidance about money – without paying through the nose. In Appendix 1 you can learn what really caused the financial crisis of 2008-9 – and why it’s probably not the last. In Appendix 2, discover how the confused economics profession has recently given Nobel prizes to two experts . . . with opposing views! Appendix 3 tells you what you must know about investment assets. Appendix 4 reveals how state pensions work, how they’ll change in 2016 – for the better for many – and how yours could be worth £200,000. And in Appendix 5 I’ll show how many young people could build a fund of £50,000 or more, simply by saving the price of a coffee each day. Yes, but is it any fun? Well, this book helps you grasp the fundamentals of money by demystifying all that boring and complicated stuff that surrounds it. And it’s written in plain English; there’s no gobbledygook here. Let’s face it, most books about money are deadly dull but I think you’ll have a laugh here as you start to discover just how very silly some ‘experts” ideas actually are. I take on the overcharging salespeople – like the character on the front of this book (who ‘charges’ too much!) and other badly trained investment and pension advisers – and those unscrupulous scammers too. You’ll see how the great financial crisis was caused by the confused ideas of our politicians and economists. And you’ll learn how these people (and a few financial journalists) are not quite as clever as they’d like you to believe! 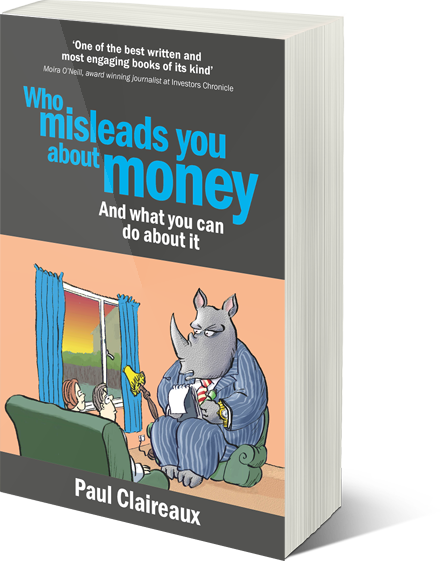 In his two-book series Who misleads you about money and How we mislead ourselves about money, Paul Claireaux uses his natural skill as an educator to teach his readers important lessons about personal finance. Paul avoids the trap of filling pages with dry charts of stock prices and statistical tables and instead turns his insight into a simple, often humorous narrative that people can really learn from. Paul’s focus on our relationship with money is especially important. The latest research in behavioural science has shown that we humans are far removed from the perfectly rational calculating machines that economic and finance theory assumes us to be. When it comes to making decisions about money and investing, we humans are deeply flawed; our instinctive behaviour is often far from rational and rarely optimal. Over this series you will learn both how our behavioural biases undermine the foundational ideas of economics and finance, and why this renders some financial advice worse than useless. You will also learn how marketers and salesmen are able to turn our emotions against us: Paul’s characterisation of the financial salesman as a rhinoceros – thick skinned and prone to charging too much – is painfully accurate. It is also a great device to make an important message stick in the mind. Paul rightly warns of the tricks and shenanigans played by the financial services industry, but his most important warning is to mistrust our own behaviour. When it comes to managing our money, we are often our own worst enemy. The good news is that with a little effort we can learn to overcome our poor financial instincts, to avoid the worst practices of the financial industry and to get more from our money. Forewarned is forearmed; with these books you can arm yourself for a more rewarding relationship with your money. Who can you trust about money?